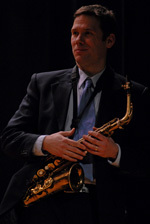 Dave Fisk is a saxophonist in Albany, NY. Dave’s interest in music started at a young age. His father, David Fisk Sr, was the source of his inspiration. His Father,(an amateur musician) introduced him to many styles of music; from Mozart to Hendrix to Paul Simon to Stan Getz. But it was when Dave’s father played Miles Davis’s album “Jazz Traxx” that Dave became “hooked” on jazz. The group on the album contained such notables as Juliann “Cannonball” Adderley, Alto Sax and John Coltrane Tenor Sax. After Crane, Dave started his professional teaching career at the Taconic Hills Central Schools. Now, for the past 12 years he has been at Niskayuna Central Schools where he is the director of the high school jazz ensembles and also the director of the high school concert band. Teaching music, especially jazz, has become a passion for Mr. Fisk and continues to inspire him to this day. In addition to teaching, Dave has been a regular performer in the Capital District. As a leader of a quartet he has performed regularly at local venues. He is also a member of Keith Pray’s Big Soul Ensemble and has had the honor of being a guest with many other area Jazz musicians. He has also performed with the Capital Region Wind Ensemble, Empire Jazz Orchestra (as a sub) Leo Russo Octet, and the Leo Russo Big Band.